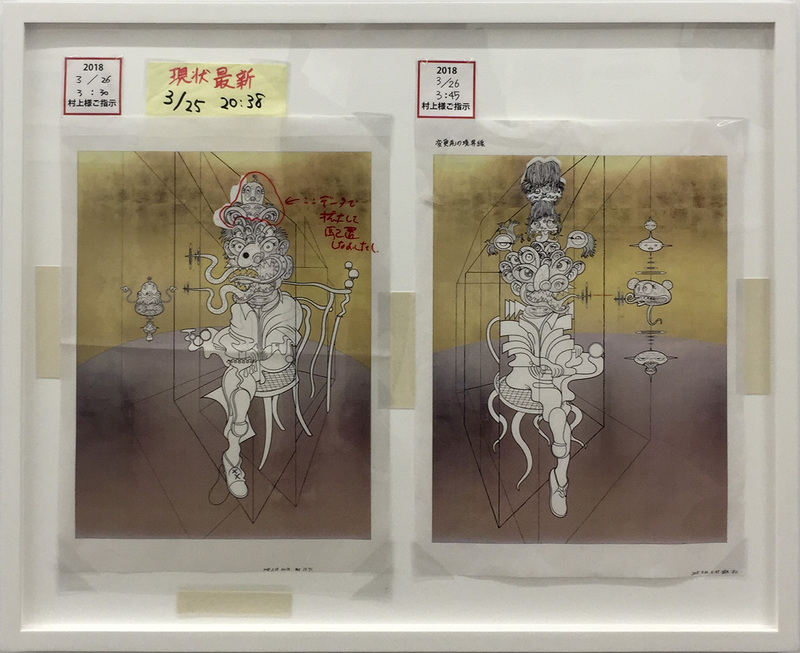 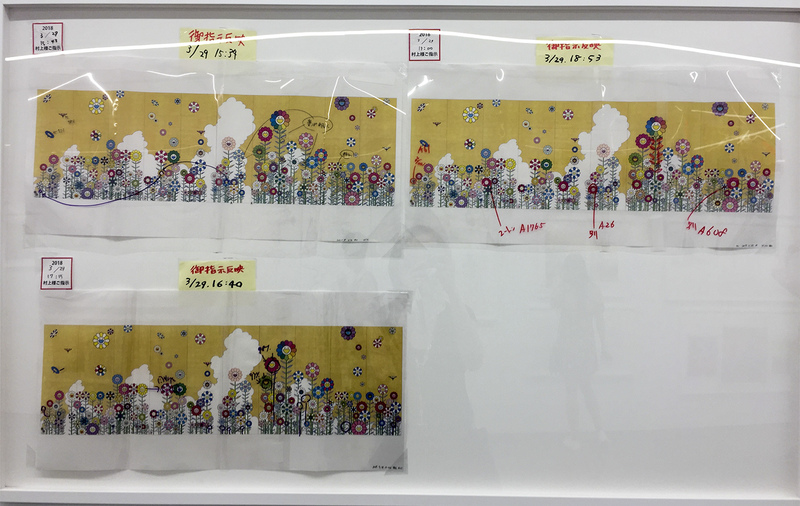 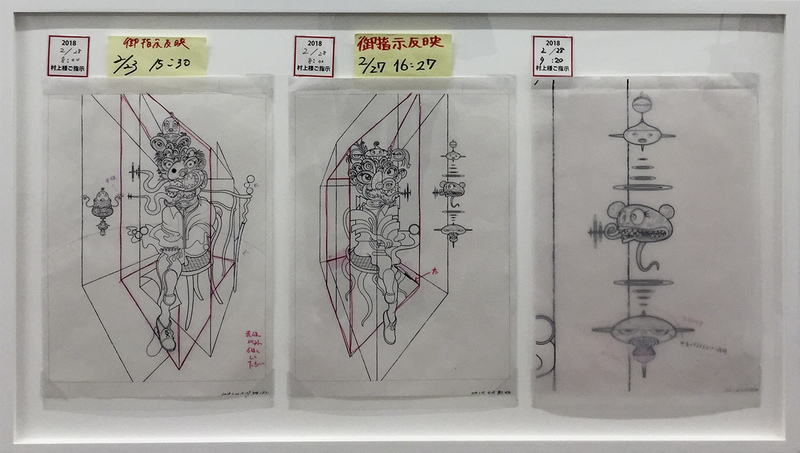 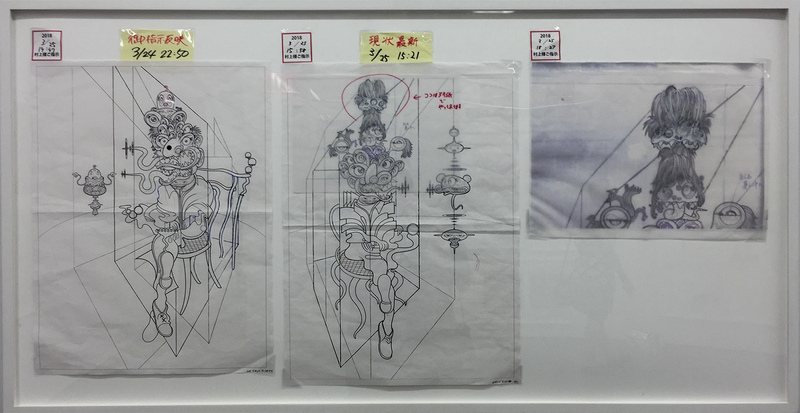 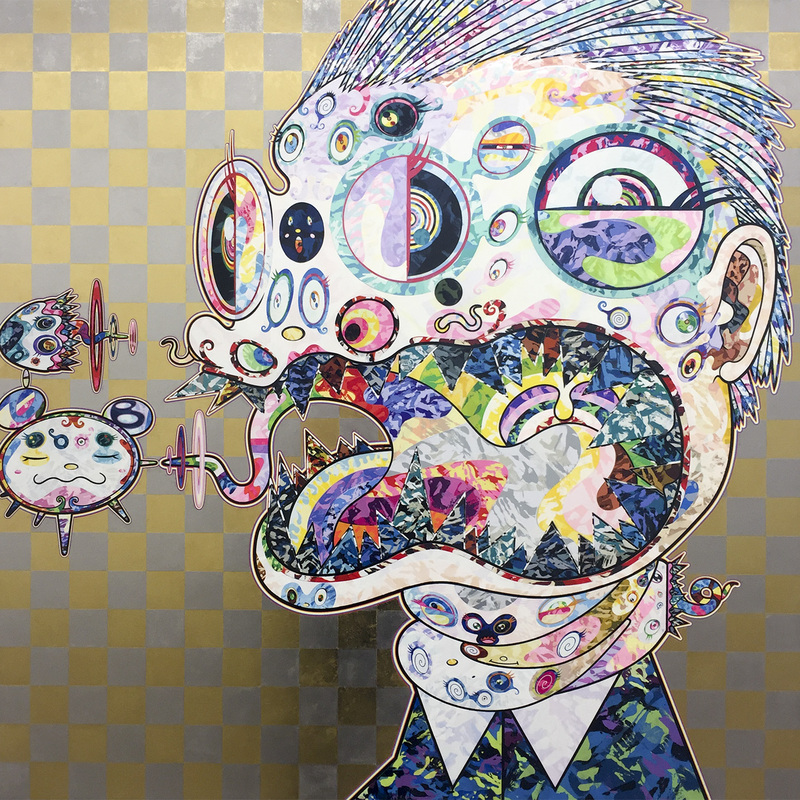 Takashi Murakami’s “Heads↔Heads” solo exhibit at the Perrotin Gallery is an unexpected treat. 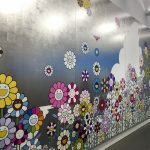 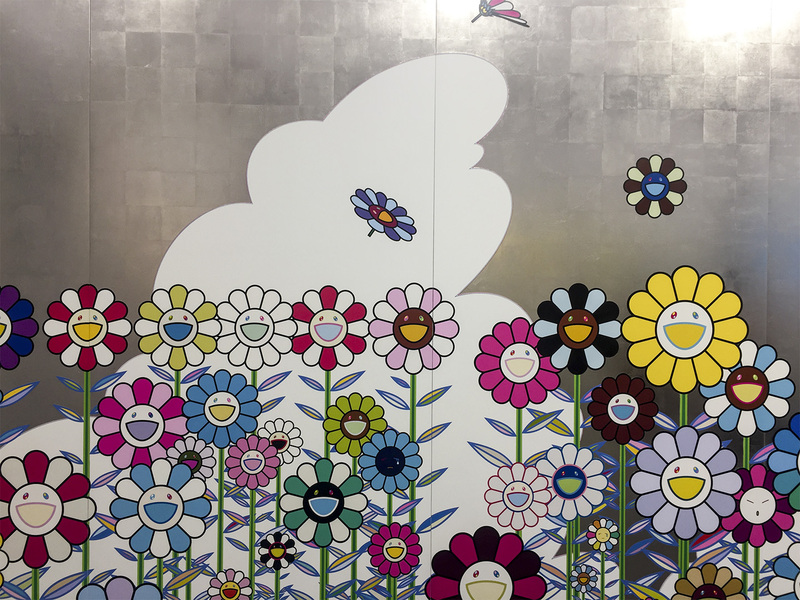 The entire first floor displays his signature murals featuring multi-colored flowers with happy faces, some dislodged from their stems and gleefully floating in air. 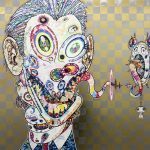 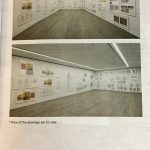 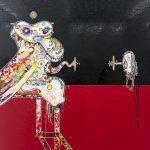 One 49-foot-long mural in acrylic on platinum or gold leaf on canvas or acrylic on canvas features a turquoise blue backdrop. 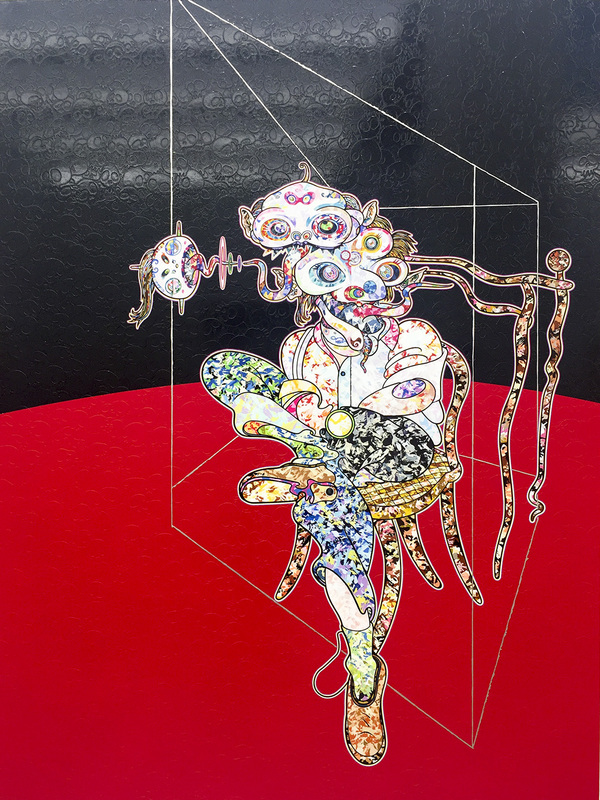 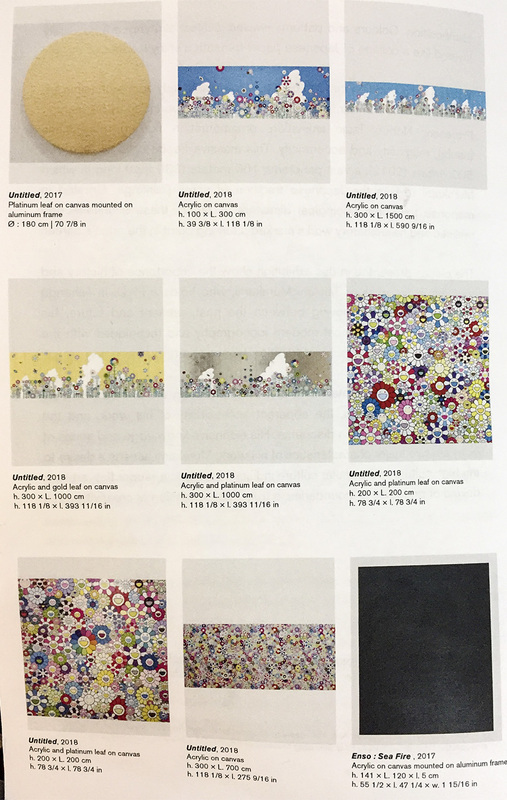 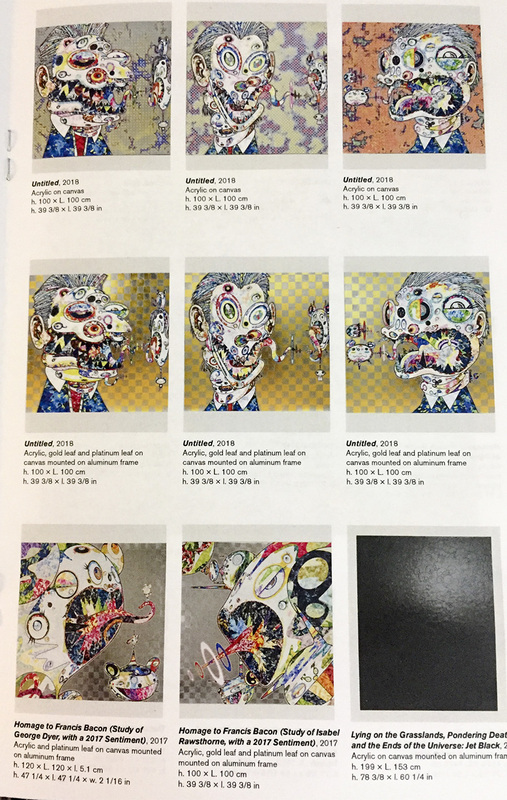 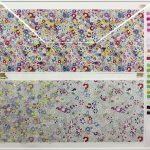 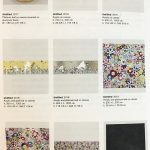 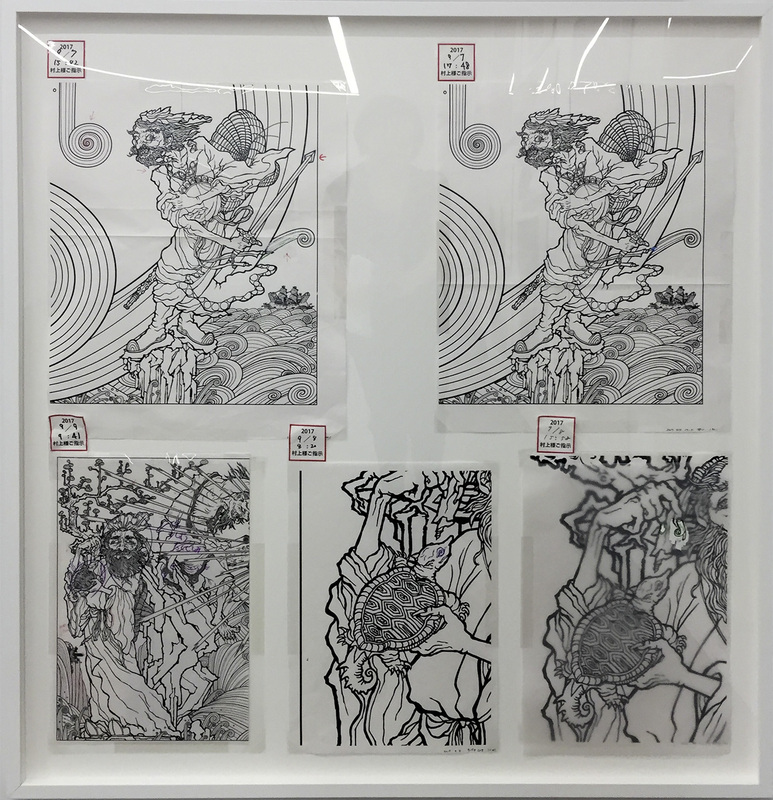 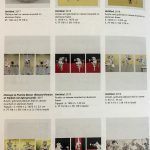 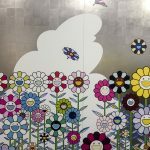 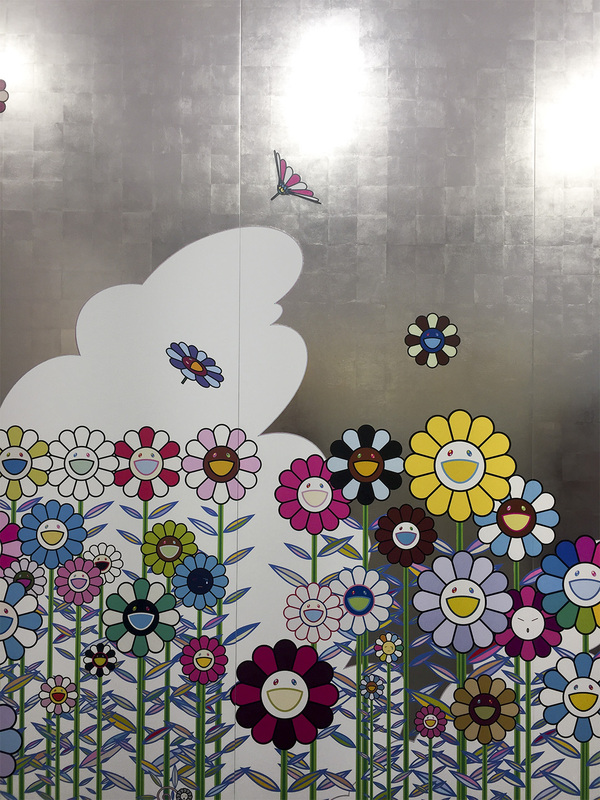 The new Murakami pieces presented on the second and third levels were created between 2002 and 2016. 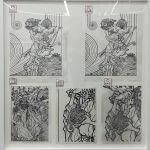 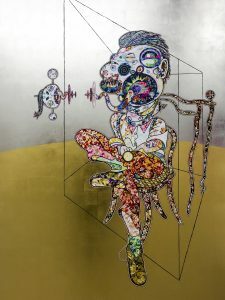 Some of these feature a subtle pattern of skulls of acrylic on canvas in all black, silver, or gold mounted in circular or rectangular aluminum frames. 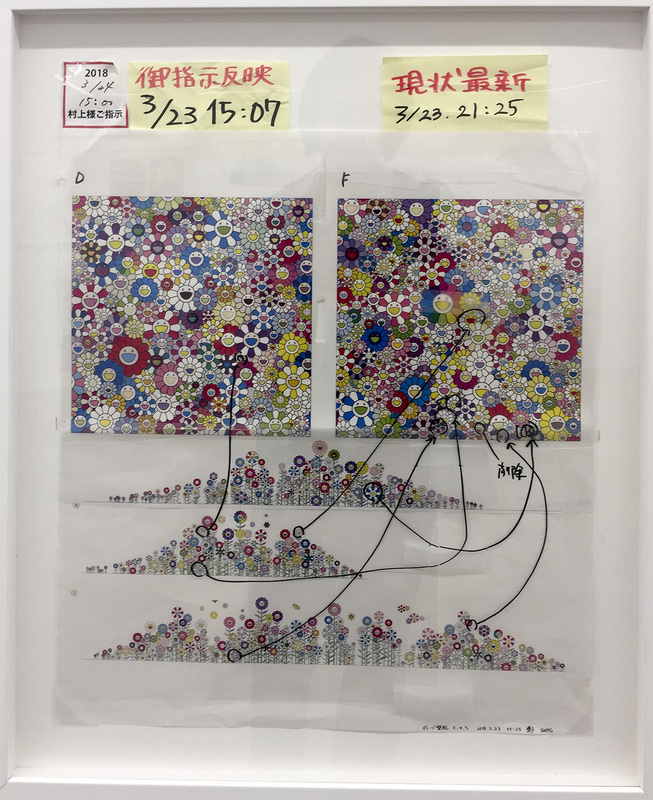 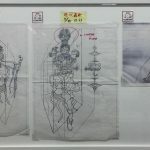 This same pattern appeared on many other series of paintings presented. 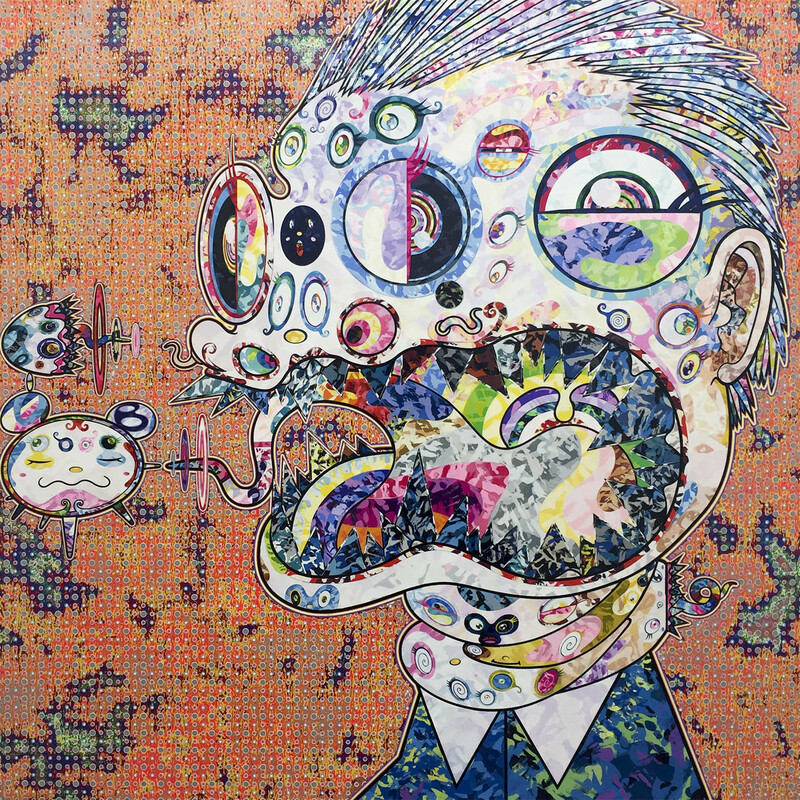 Key subjects of these works included bulbous figures with faces projecting another face or tongue in rainbow mosaics and colors with squiggly eyes. 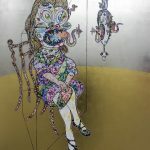 Many of the figures, in addition to having a tongue protrude from its body, had an appendage of some type often pointing in the direction of a smaller figure parroting its body position. 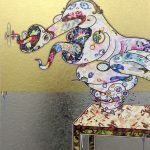 A series of paintings inspired by Francis Bacon’s 1969 “Three Studies of Lucian Freud” show Freud sitting down in a transparent structure which provides an interesting perspective to both artists’ series. 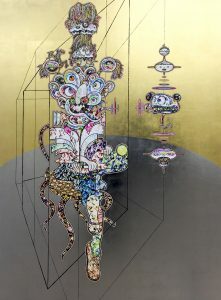 Freud’s face and body appear to be distorted as well, notably his face. 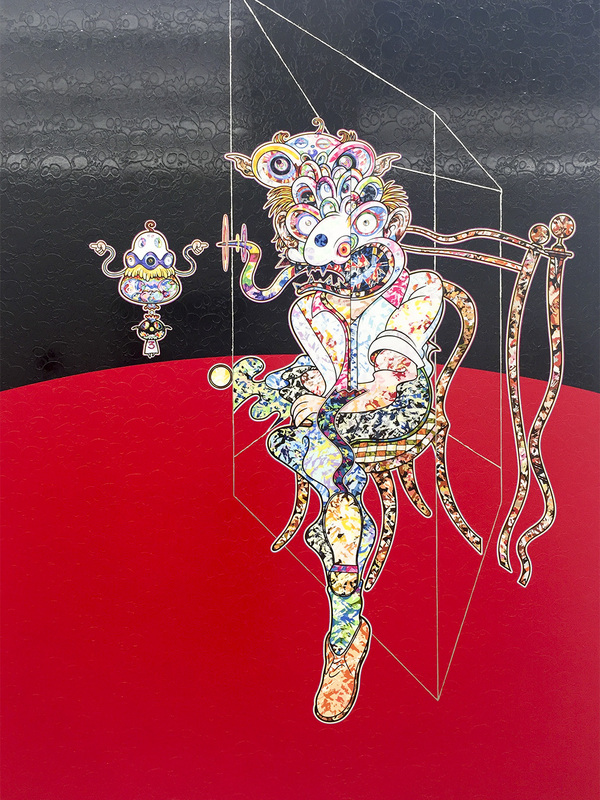 Unlike Freud, Murakami features figurines with female appendages, as well as less identifiable creatures. 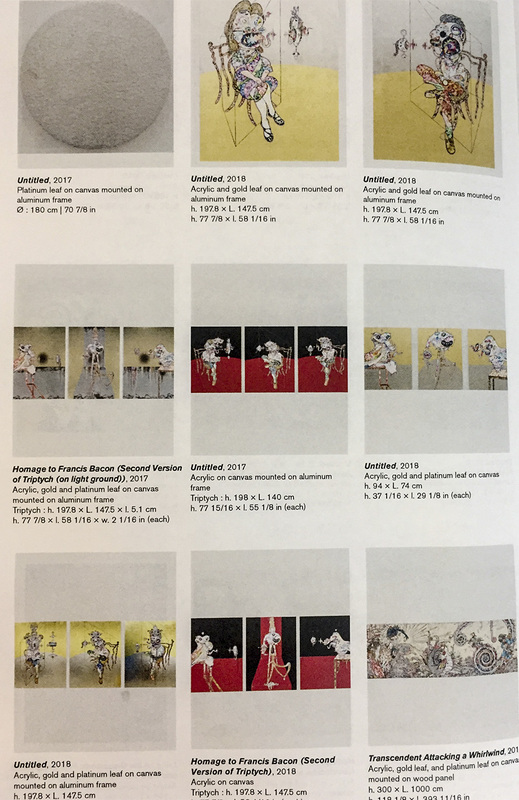 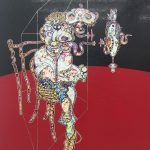 The three images above comprise a series of paintings titled Homage to Francis Bacon (Second Version of Triptych (on light ground)), in reference to Bacon’s 1983-84 “Triptych” trio. 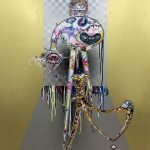 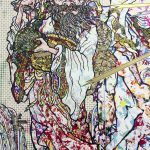 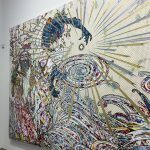 The majestic 2017 “Transcendent Attacking a Whirlwind,” occupying an entirely separate room, is comprised of acrylic, gold leaf, and platinum leaf on canvas mounted on ten wood panels and measuring 33 feet long. 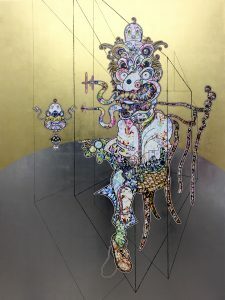 A rendition of Soga Shohaku’s 1764 painting on display at the Boston Museum of Fine Arts, Murakami’s version is more colorful and includes more figurines, some perhaps more subtly rendered (or not at all) in Shohaku’s piece, but brought to life in Murakami’s, like the mer-dragon and the demon. 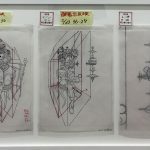 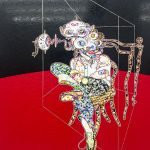 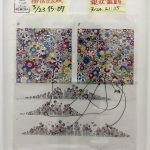 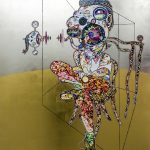 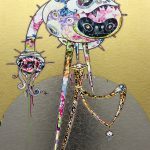 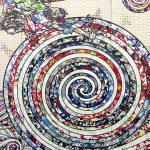 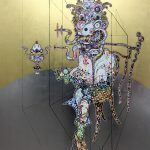 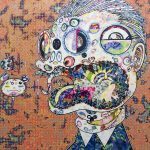 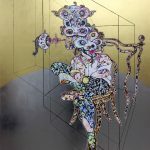 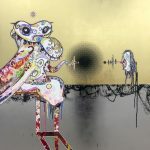 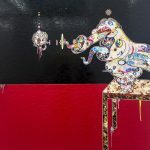 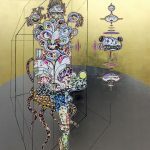 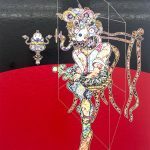 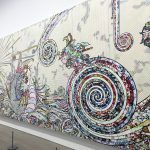 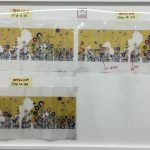 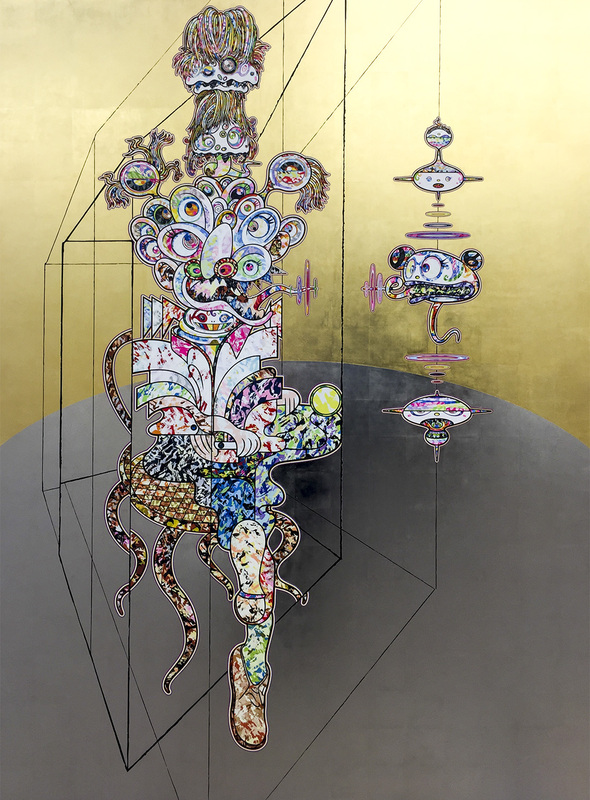 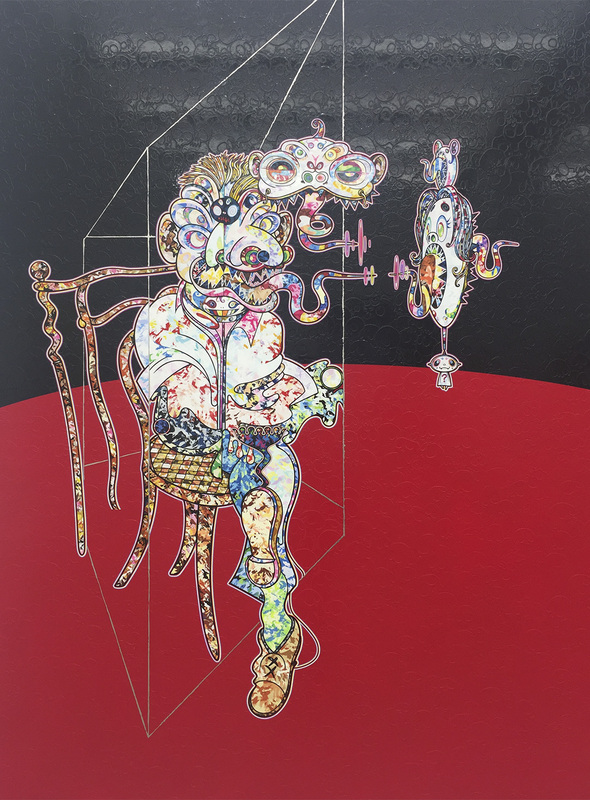 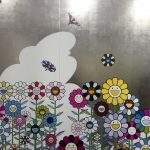 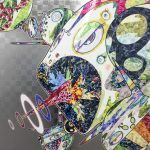 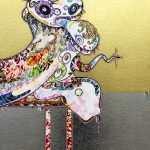 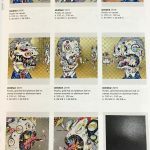 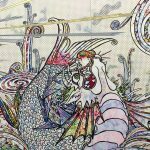 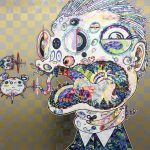 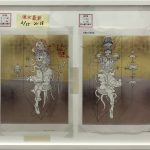 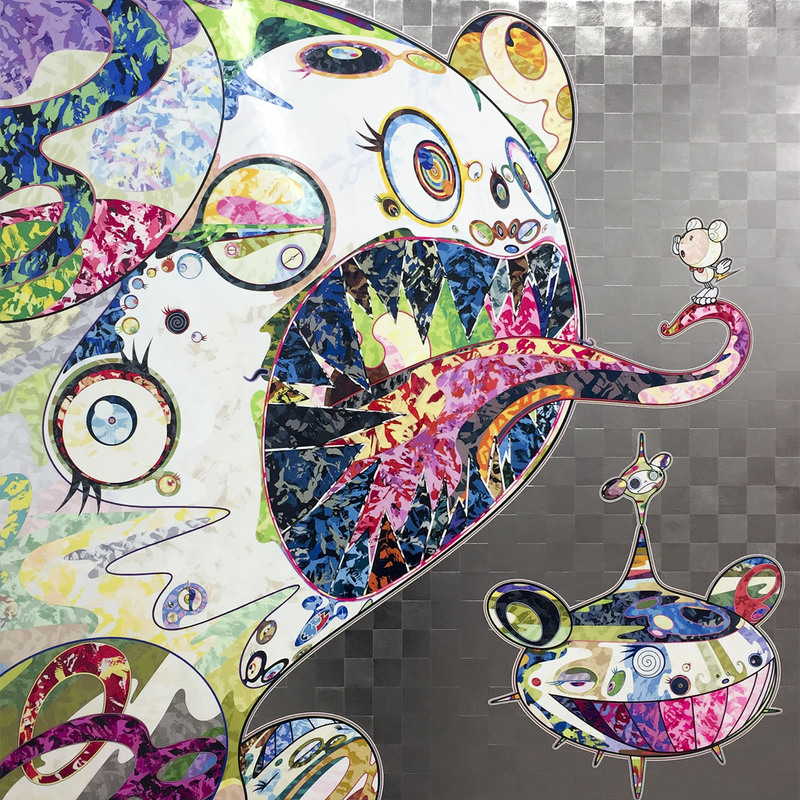 Murakami’s piece captures the ‘Superflat’ movement he helped shape and define in his rendering of a traditional Japanese painting into something modern, colorful, and manga-like. 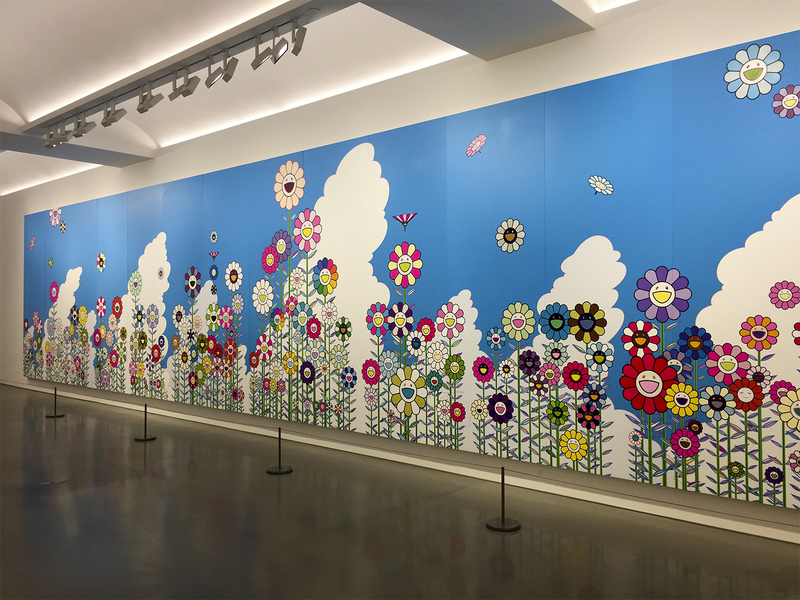 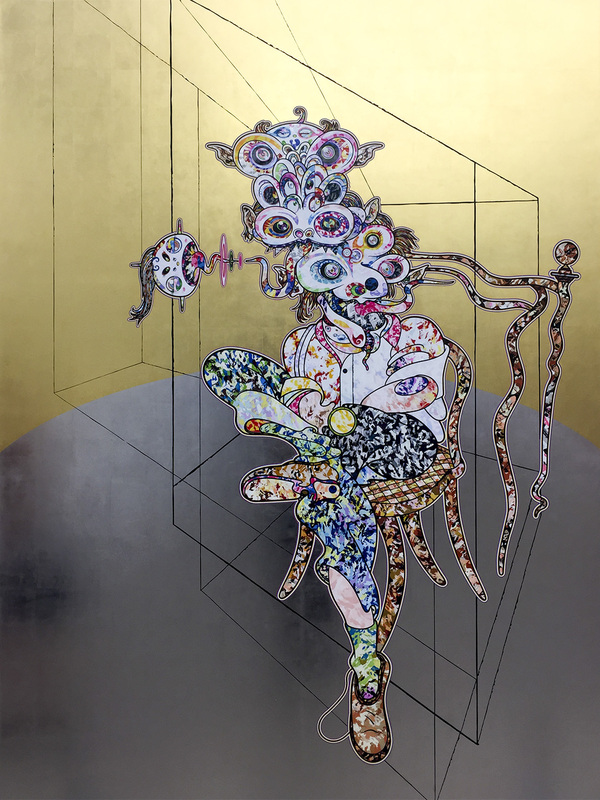 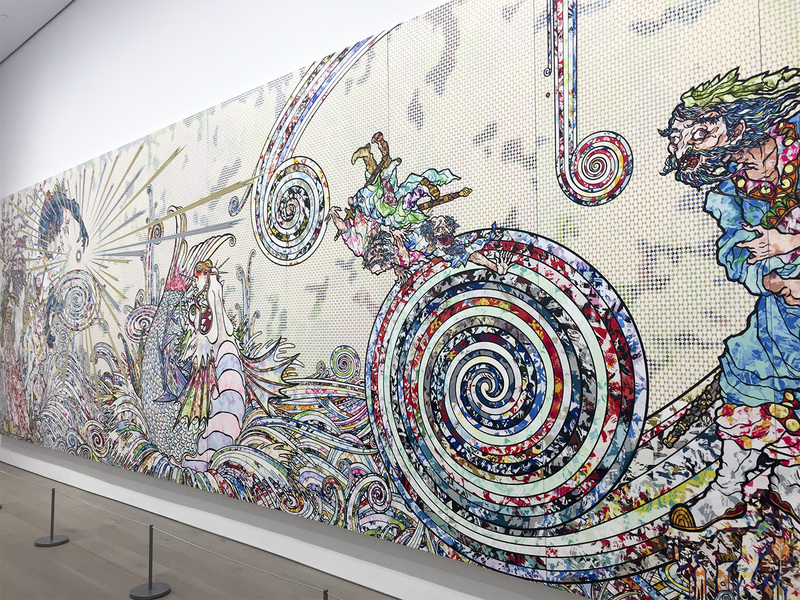 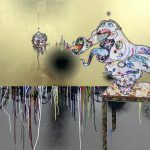 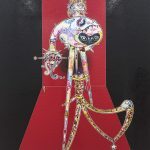 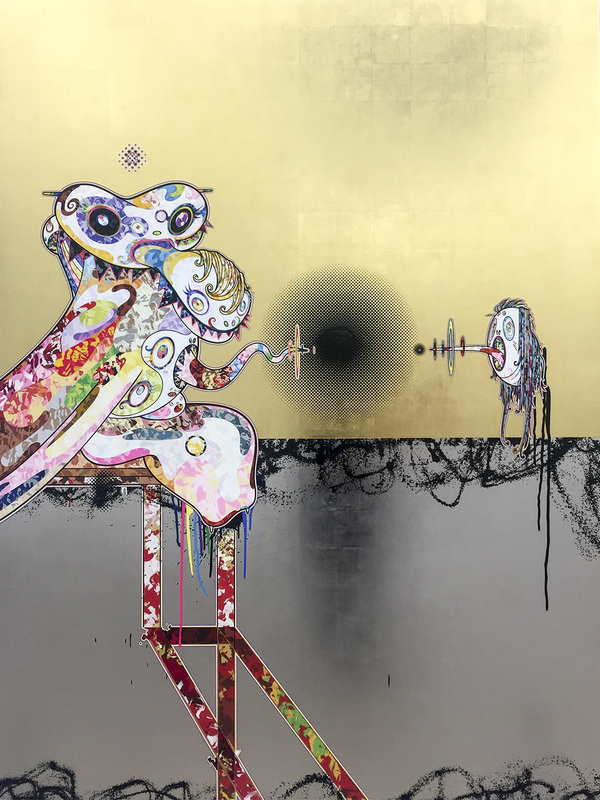 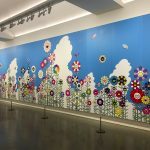 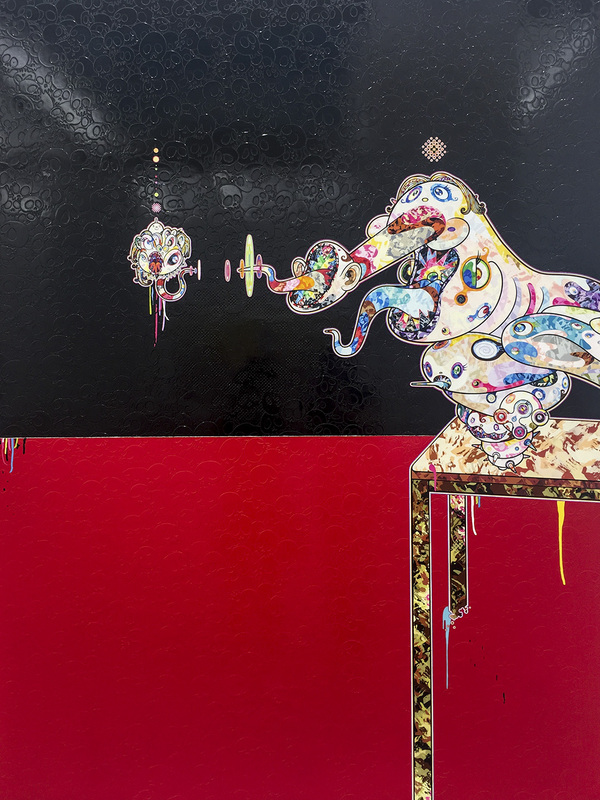 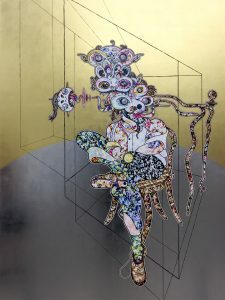 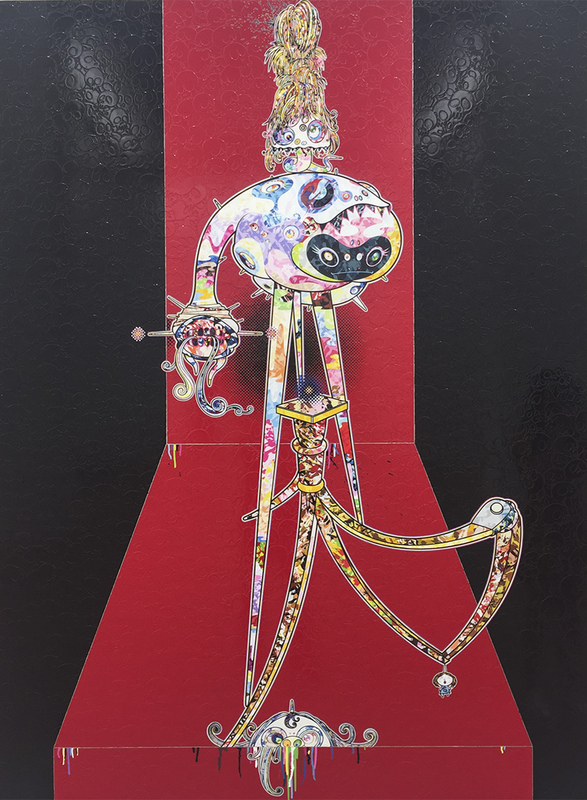 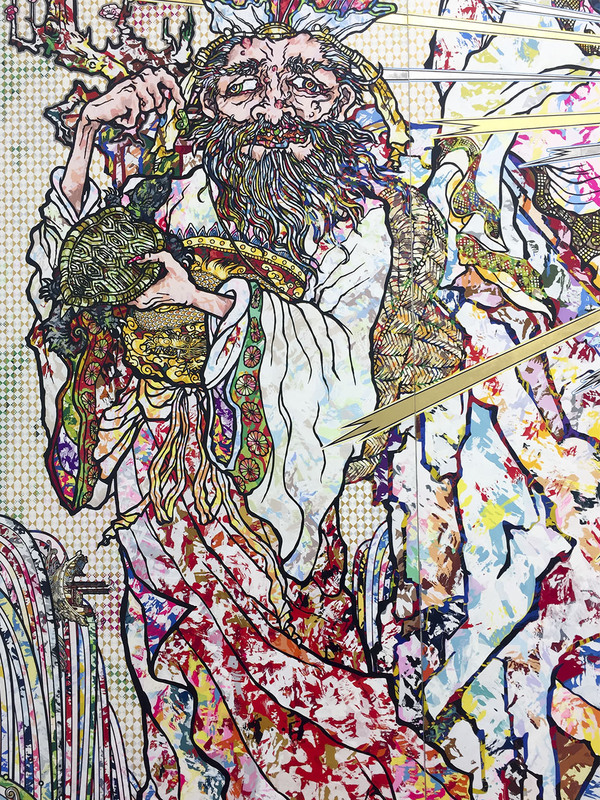 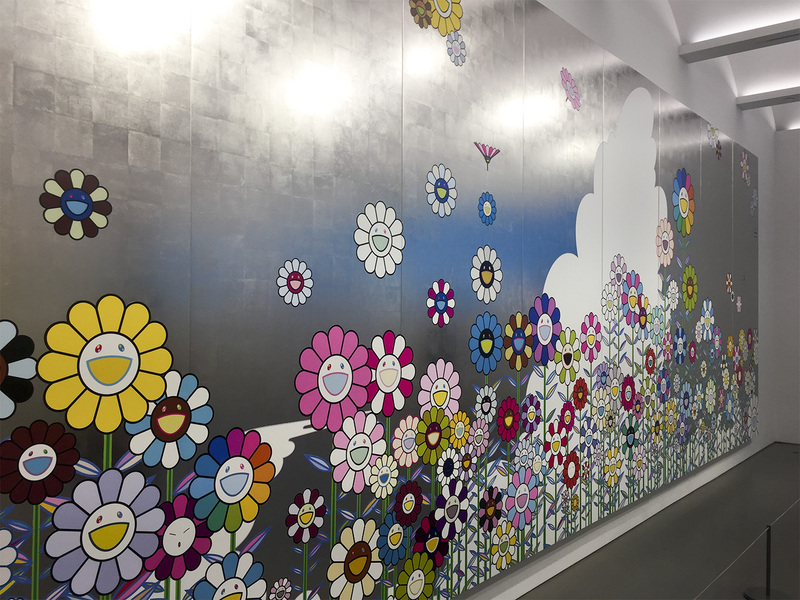 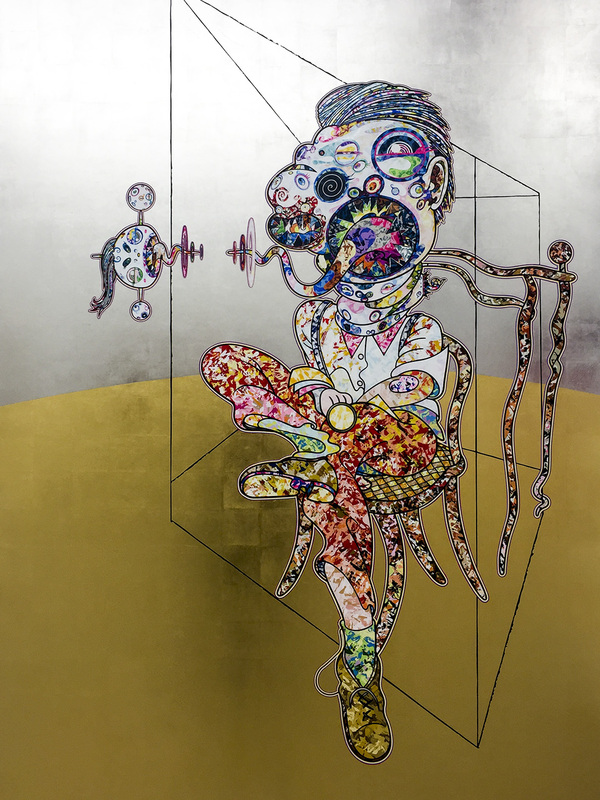 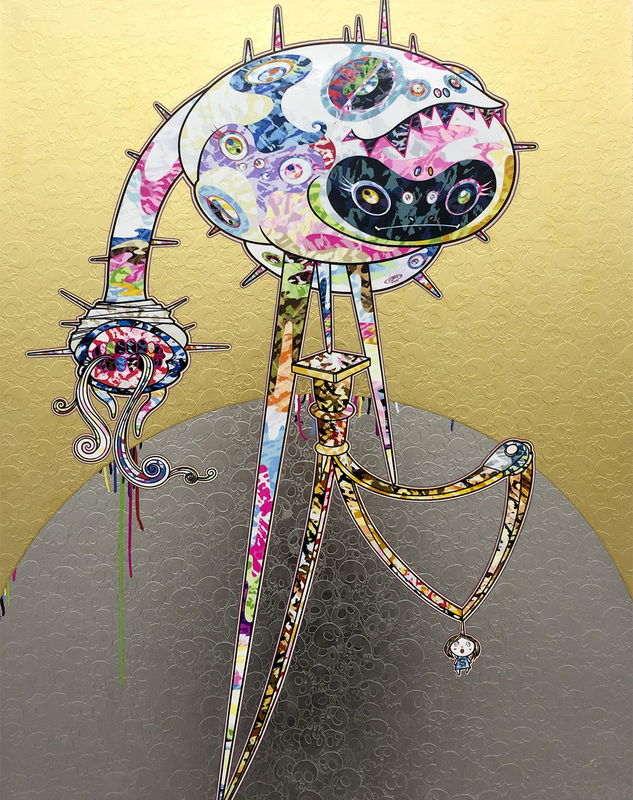 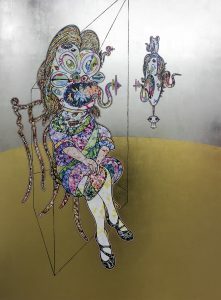 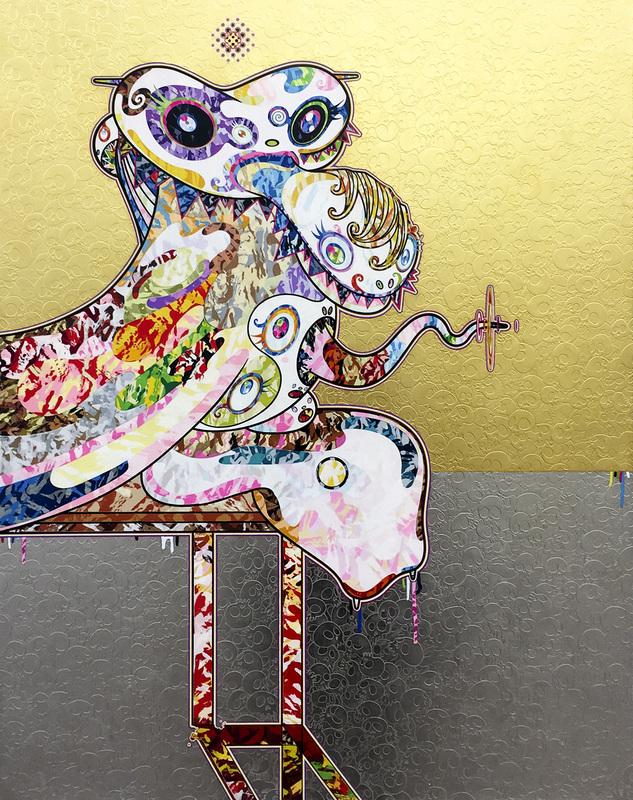 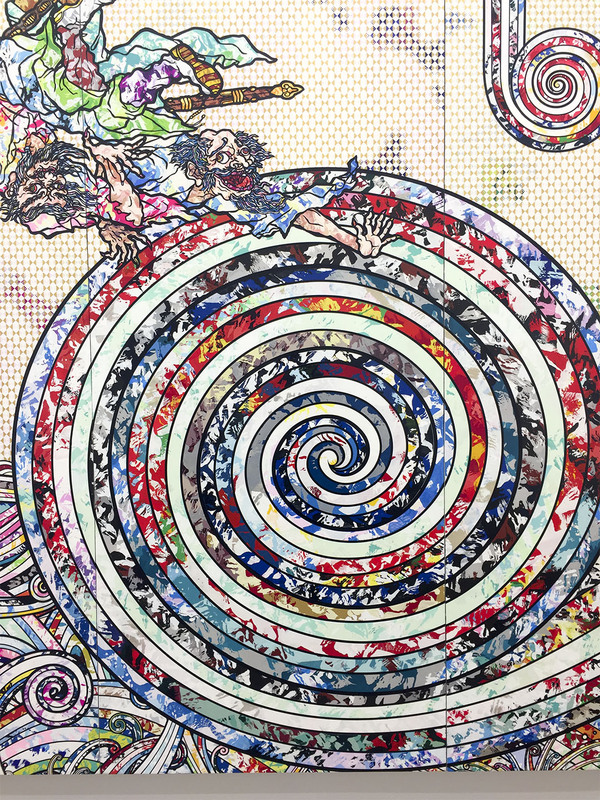 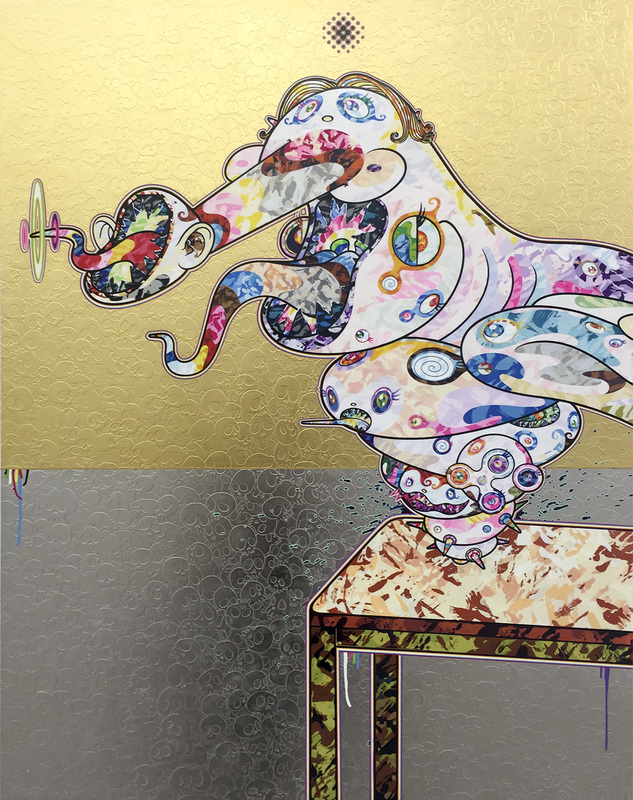 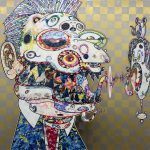 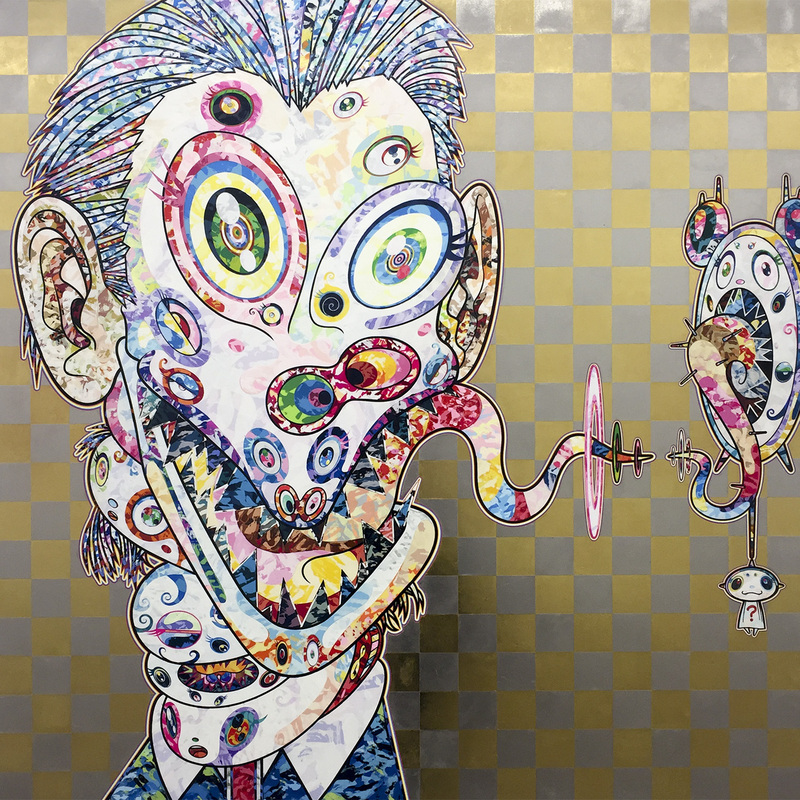 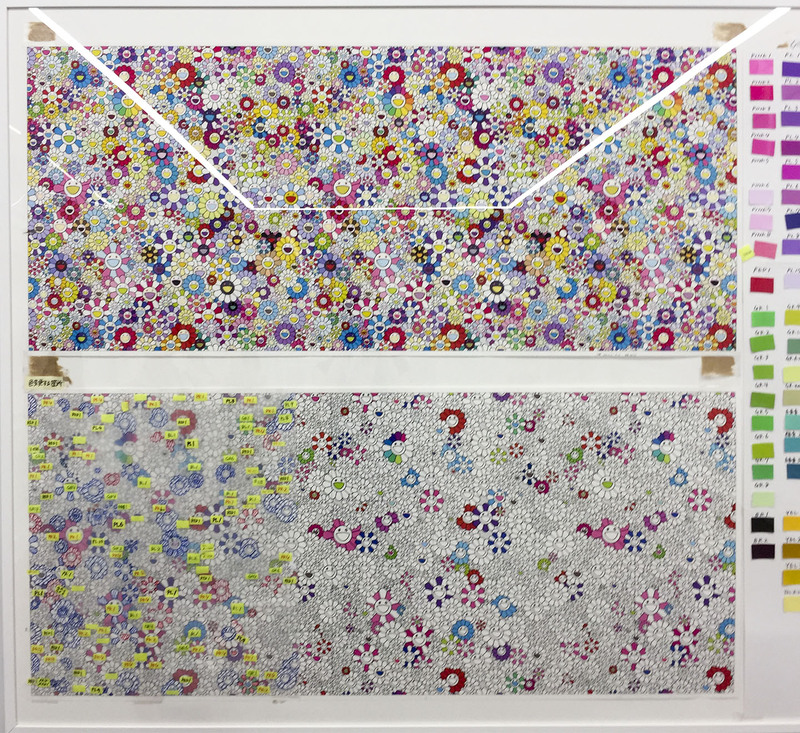 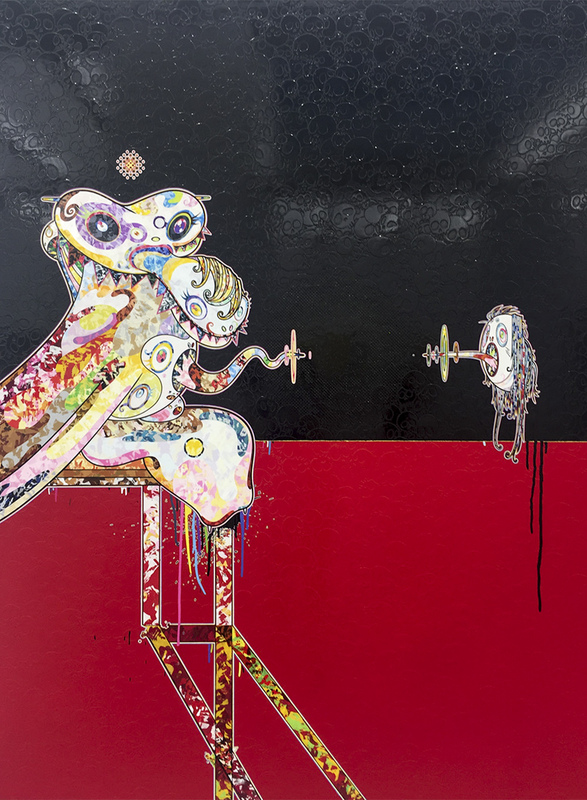 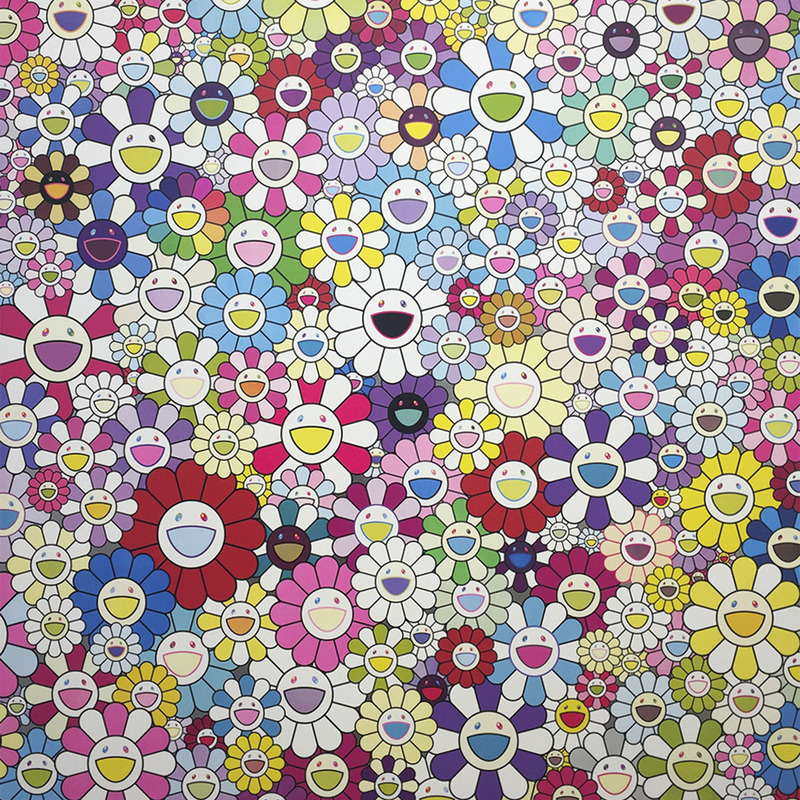 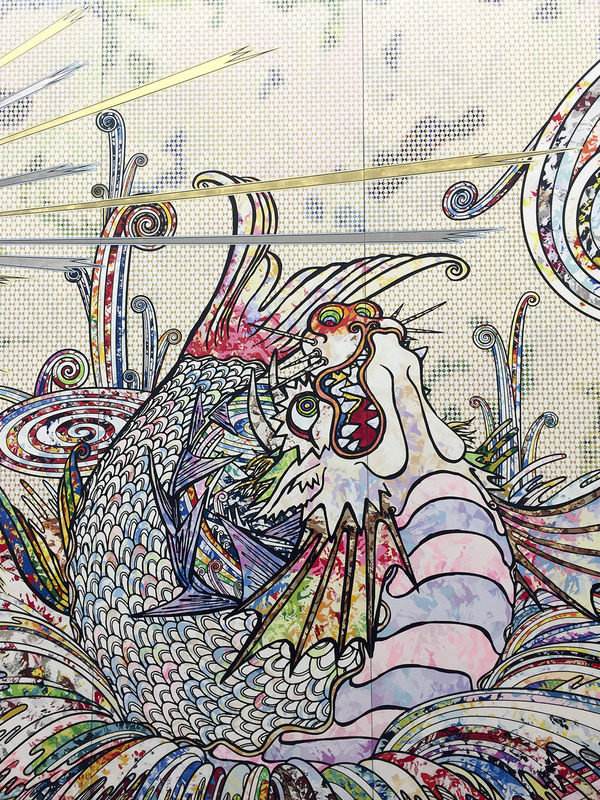 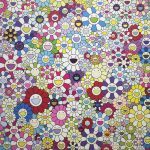 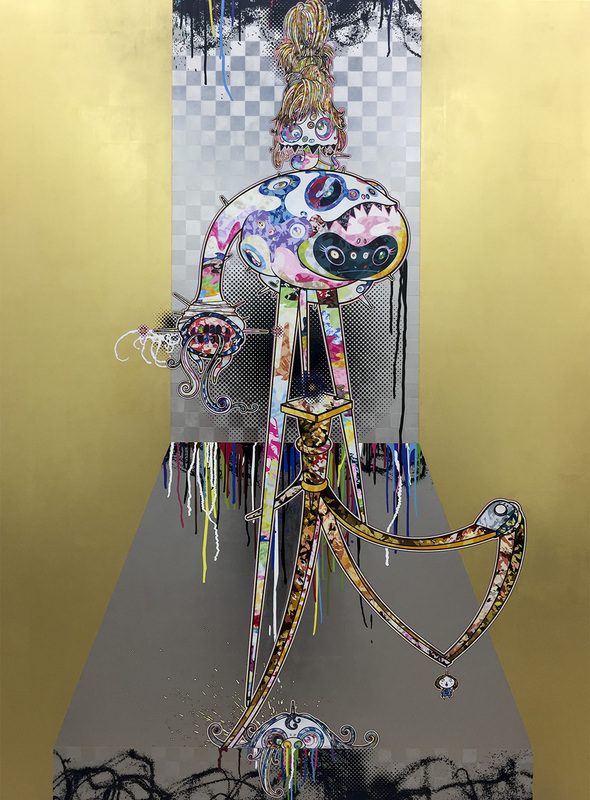 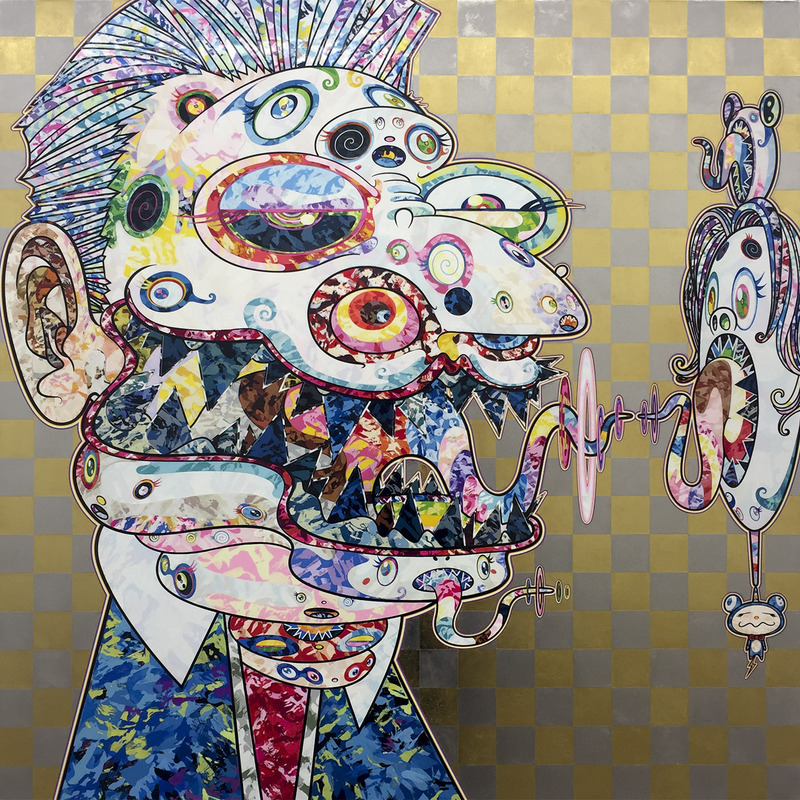 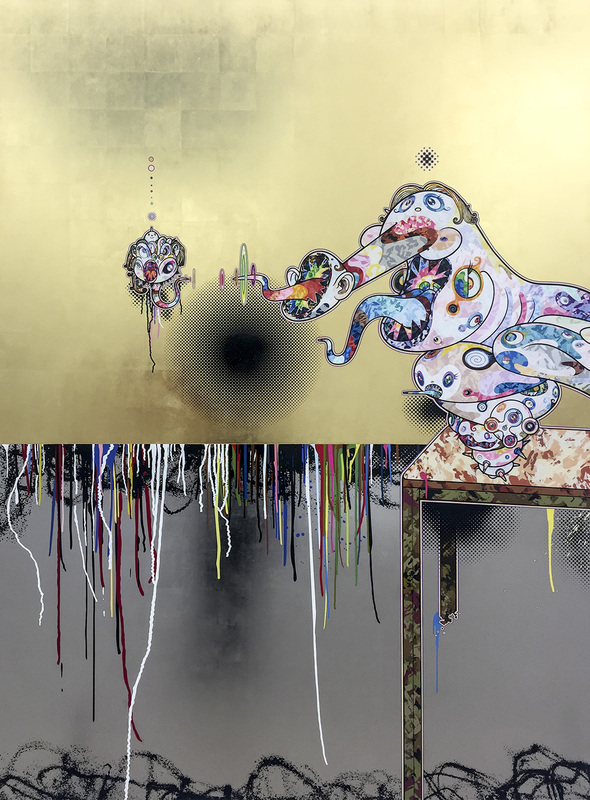 Takashi Murakami’s solo exhibition at Perrotin Gallery runs until June 17. 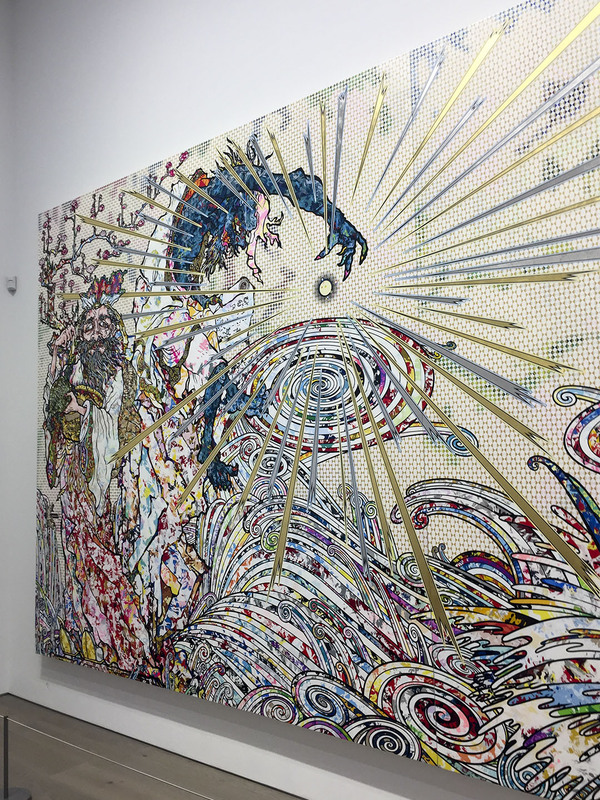 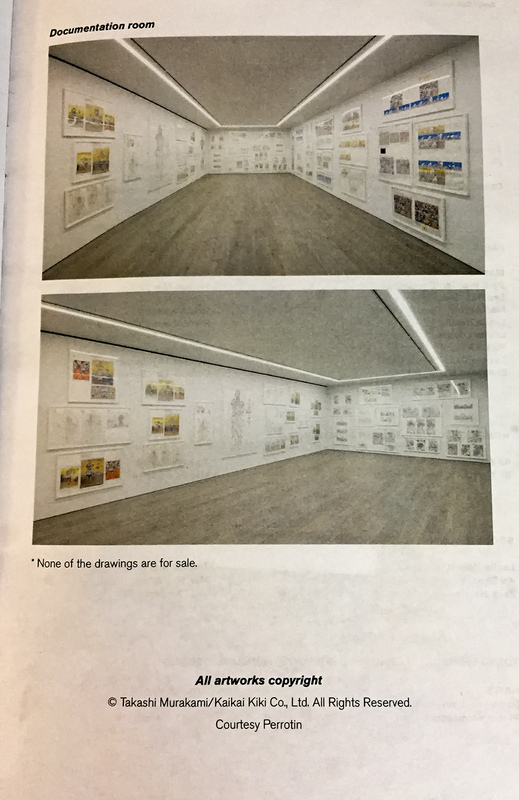 Located at 130 Orchard Street, New York, NY, 10002, the gallery is open Wednesday through Sunday, 10 a.m. to 6 p.m.